CBS is reporting that "In his first fight on U.S. soil since 2016, and his first fight as a 40-year-old, Manny Pacquiao cruised to a unanimous decision victory over Adrien Broner at the MGM Grand in Las Vegas to retain his secondary WBA welterweight title. 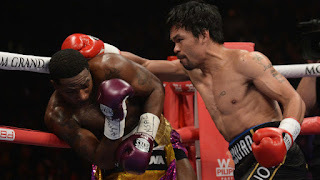 Using aggression and quickness, Pacquiao outclassed the reticent Broner, who sat back in an attempt to counter, but threw hardly any punches, and landed even fewer." Pacquiao said he wants a rematch with Mayweather but Leonard Ellerbe, CEO of Mayweather Promotions said Mayweather's retired and has no interest in a Pacquiao rematch. It's wise to quit while you're ahead. He might not win a second time.